Coho Salmon (Oncorhynchus kisutch) also known as silver salmon, are powerfully built and can jump falls that many other salmon can't negotiate. Coho average about 10 pounds, and are the most exciting salmon in Alaska, and at the Royal Coachman Lodge we have some of the best Salmon fishing in Alaska. Because of their aggressive strikes and strong fight, Silvers are a favorite salmon of the fly fisherman. The Silver Salmon is the only salmon that you can consistently catch on dry flies. Alaska silver salmon fishing on the Nushagak from late July to late August, and on the _____ river from roughly August 7 to the end of September. 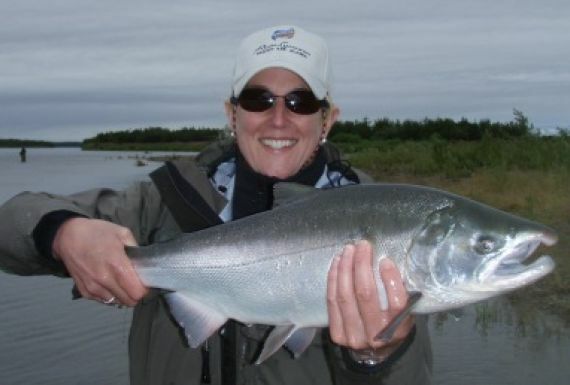 The areas we fish silvers on the Nushagak are just a 15 minute flight from the fishing lodge in Alaska. The ____ river is a small coastal stream located in the Togiak National wildlife refuge. The silver salmon is arguably the perfect Alaska salmon for sport fisherman. They are eager to chase spin gear and flies and when caught their acrobatics will amaze you. Consistently we catch fresh fish well into late September. We offer great wade fishing opportunity on several different locations. As well as gentle boat fishing for the lesser aggressive wading angler. If we get high water levels, limiting wade angling, NO PROBLEM! We pride ourselves in getting ANY angler into the action. Our guides will hold the boat up to their arm pits to get you into a comfortable casting range. This extra effort is where the Royal Coachman Lodge excels above other lodges in Alaska. Silver salmon season is a special time of year. 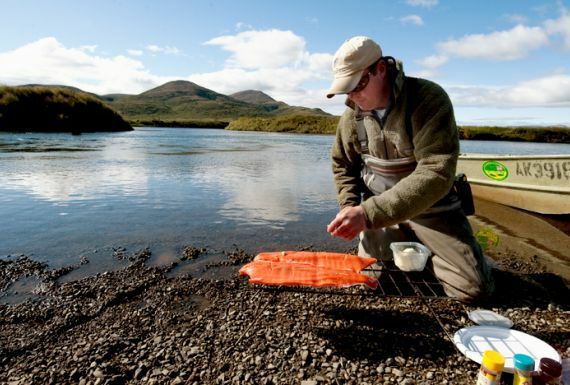 I picture our veteran guide Scott Schumacher preparing his famous shore lunch stream side, on the river. The bull moose in the distance, echoing there mating calls deep into the tundra valleys. And the stunning colors of the fall foliage from the view of the warm float-plane ,as it wisps you back to the comfort of the lodge is certainly a memorable part of each vacation. Come to our Alaska fishing lodge to enjoy some of the best silver salmon fishing in the world!